According to that campaign from December 1 – 30, at least one photo will be uploaded to its Facebook Page, where all SHAON84 photos will be hosted. This is a great starting for SHAON84. 1 Bonus will be another special update at its Flickr Account (not disclosing new account URL) which will contain the best photos of SHAON84. The photos will be chosen based on response from Facebook Page and Shaon’s choice. The last update would be available on 31 December 2012. 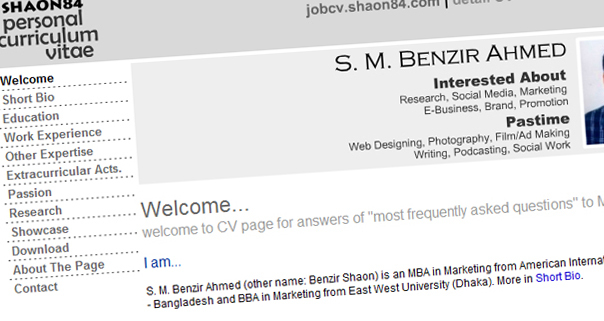 SHAON84 has launched SHAON84 Personal Curriculum Vitae page, a new section under SHAON84 Personal. For professional excellence, better connectivity and answering some very common question about the creator Benzir Shaon, this new segment has introduced. This page is for corporate persons, entrepreneurs, employeers, university officials, professors/faculties, educators, social workers, scholars and other relevant persons & bodies who need to know about Benzir Shaon for relevant work purposes. This is the first and only page of SHAON84 which is exempted from having compulsory update show-up in SHAON84 home page. Please visit this page and keep checking “Update Log” regularly for latest updates of this sub-segment, SHAON84 Personal Curriculum Vitae. 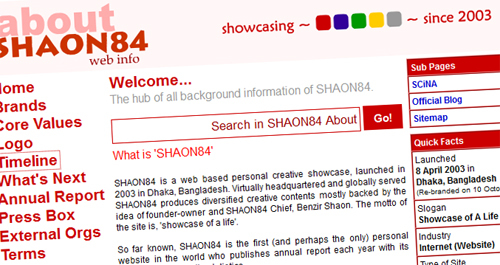 On 31 October 2012 Wednesday, the idea SHAON84 has been presented in Google Business Group – Dhaka event hosted in EMK Center. It was the 4th event of GBG-Dhaka. That 2 minutes’ short MS Power Point presentation (time counted 1.49 minute) presented by Benzir Shaon with lots of enthusiasm from the participants during and after the presentation. The presented MS Power Point presentation can be downloaded from the Press page of SHAON84. GBG – Dhaka is an open community of local entrepreneurs and professionals who are interested in using the internet to make their business more successful. Since being launched in May 2012, this community has been meeting regularly to explore, learn, share and discover how Google products can enhance local businesses and to listen to speakers from around the world. SHAON84 thanks the GBG-Dhaka team for inviting and giving the space to present. We are in the age while Facebook Page owners celebrate million Likes, at least hundred thousand. But here, SHAON84 celebrates 100 Facebook Fans! Fun or Something else? Yes, it may seem so, but celebrating H-u-n-d-r-e-d Faaaans (ok, if you mind, not ‘Fans’, just ‘Likes’) has a different background. After being founded in 2003 as ‘SHAON’, it re-branded to ‘SHAON84’ on 2010 with this new Facebook Page. With less promotions and with almost zero content, SHAON84 gained this number of Likes just because of you, your support to the work. In future, while there will be lots of hit making contents on the page, there may be lots of people aside of SHAON84. But, whatever it happens tomorrow, these hundred should be thanked first, as they started before millions (!). One important point, for the first time SHAON84 (also true for personal profile) tagged some faces. It has been tried best to tag the right person. You are most welcome to tag yourself, if you are kept untagged or if you want to be a part of it. This tagging is not for promotional purpose, rather just a part of thank giving. SHAON84 believes in privacy of its users and viewers. You may Un-tag yourself if you want. Otherwise, just one more great thank to keep your name on ‘Thank Photo’! A big s-o-r-r-y for them, those names are kept untagged or not shown. But they are in the thank list too. “Mohammad Habibur Rahman, The 100th Fan & 70th Friend (of Admin) in SHAON84. Thank You Very Much.”, A status post on 30 July 2012. It took that long time, because, just after that date some number dropped suddenly. Now (till date) the page has 106 Likes. In 100, 70 friends of Benzir Shaon liked SHAON84 page (30% are not in my friend’s list!). After many days’ work, SHAON84 releases its new ‘About’ page. There are some special things to note about this ‘About’ update. No # 1: New Look: The entire design changed after it first launched in 2008. New banner, search engine, menu, right panel quick fact list, less pages – all gave a new look. No # 2: Change in Definition: This time, after almost nine years, SHAON84 changed its general site definition a bit. Now, it will be termed as “personal creative showcase”. Earlier it was termed as “Personal website”. In the fact list, ‘about profit motive’, it answered “Non-earning”. No # 3: Better Profile: Comparing to earlier days, SHAON84 now has a well described (and well matured) site profile in About page. This will surely help others to understand well about the real SHAON84. No # 4: Uncovering Tomorrows’ Secrets: A new page titled “What’s Next” introduced, where you can find possible future updates’ info. There is a live calendar on top of page having future update deadlines. Secret Lab open now! No # 5: Event Matters Open: In “What’s Next” page, a Google Calendar widget has been placed at top, where you will find all future events where Shaon (me) may visit. This will help you to catch some good events. This calendar will also show-up some future virtual events of SHAON84 and next update deadlines. If you use Google Calendar, you can subscribe the calendar. Catch it now! No # 6: Important Terms Defined – Trademark, Logo & IP: It seems unnecessary, but due to avoid future conflict, some important terms need to be defined. It took a good amount of time to prepare it. Read it, if you have time. It’s not just a copy-paste note. No # 8: In Page Contact Form: Finally, Google Form/Google Docs used to make a contact form in the page. This has been tried for so many years. No # 9: Facebook Page & Twitter Feed Plug-in Finally: Adding Twitter feed was easy. But Facebook Page Feed in website couldn’t been possible due to some technical problems. It has finally been possible; Facebook Page and Twitter Feed are now live in the website. No # 10: ‘Press’ is Regular: Prior to this new About page, there was a Press page for media personnel. But it wasn’t that much used. 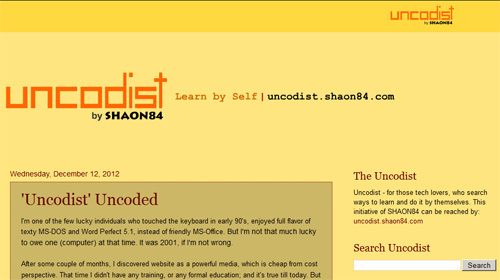 Now, special updates will be also featured here and they will be mostly linked with SHAON84 Official Blog. Old PressBox section removed, and replaced by a single page. No # 11: More about Official Logo: A full and with detail logo page including meaning, proper usage guideline and many more. No # 12: Timeline Up-to-Date: After 2008, the Timeline with detail of important achievements hasn’t been updated. It’s now updated. All, Till TODAY! It was a lot of work. No # 13: Get LESS Puzzled About Social Media: Earlier, less used Social Media Accounts’ names were also shown along with regular channels. Some less used media links has been removed, like: Hi5, NetLog etc. Huh… lot of things. Now find it by yourself! SHAON84 has been decided to postpone activity of some Groups and Pages for better social media management. Postpone doesn’t mean the withdrawal of ownership or control over those accounts or control. It also doesn’t signify the immediate closure of these Pages and Groups. Visitors and friends are requested to follow/like SHAON84 Facebook Page (SHAON84web), Twitter Profile (SHAON84) and Google Plus Page (SHAON84) listed in SHAON84 home page. Activity of the following groups and pages has been decided to postpone. Following pages and groups are getting cover pictures for the first time.